Definition at line 211 of file llpanelavatar.h. Definition at line 823 of file llpanelavatar.cpp. Definition at line 898 of file llpanelavatar.cpp. References LLTabContainerCommon::getPanelByIndex(), LLUICtrlFactory::getTabContainerByName(), LLTabContainerCommon::getTabCount(), i, and S32. 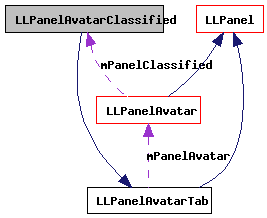 Definition at line 1020 of file llpanelavatar.cpp. References _PREHASH_AgentData, _PREHASH_AgentID, _PREHASH_ClassifiedDelete, _PREHASH_ClassifiedID, _PREHASH_Data, _PREHASH_SessionID, LLMessageSystem::addUUIDFast(), gAgent, LLPanelClassified::getClassifiedID(), LLTabContainerCommon::getCurrentPanel(), LLAgent::getID(), LLAgent::getSessionID(), LLUICtrlFactory::getTabContainerByName(), gMessageSystem, LLMessageSystem::newMessageFast(), LLMessageSystem::nextBlockFast(), NULL, LLTabContainerCommon::removeTabPanel(), and LLAgent::sendReliableMessage(). Definition at line 981 of file llpanelavatar.cpp. References LLTabContainerCommon::addTabPanel(), FALSE, LLPanelClassified::getClassifiedName(), LLUICtrlFactory::getTabContainerByName(), LLPanelClassified::initNewClassified(), and LLTabContainerCommon::selectLastTab(). Definition at line 866 of file llpanelavatar.cpp. References FALSE, LLTabContainerCommon::getPanelByIndex(), LLUICtrlFactory::getTabContainerByName(), LLTabContainerCommon::getTabCount(), i, S32, and TRUE. Definition at line 909 of file llpanelavatar.cpp. 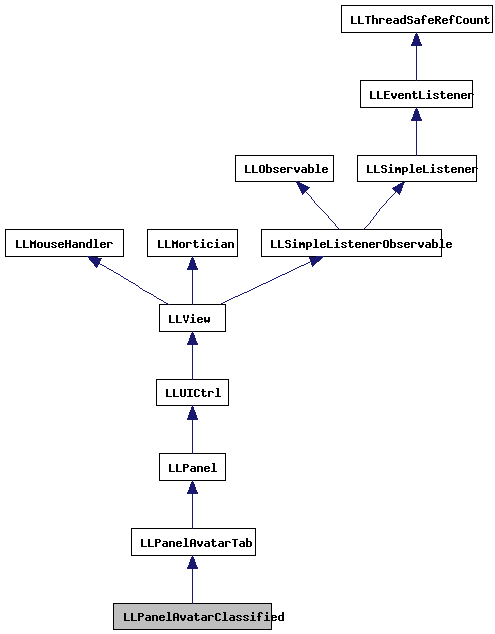 Definition at line 1000 of file llpanelavatar.cpp. References LLViewerWindow::alertXml(), callbackDelete(), LLPanelClassified::getClassifiedName(), LLTabContainerCommon::getCurrentPanel(), LLUICtrlFactory::getTabContainerByName(), gViewerWindow, and NULL. Definition at line 972 of file llpanelavatar.cpp. References LLViewerWindow::alertXml(), callbackNew(), and gViewerWindow. Definition at line 497 of file llpanelavatar.cpp. Definition at line 923 of file llpanelavatar.cpp. References _PREHASH_ClassifiedID, _PREHASH_Data, _PREHASH_Name, LLTabContainerCommon::addTabPanel(), LLPanel::childSetVisible(), DB_PICK_NAME_SIZE, FALSE, LLMessageSystem::getNumberOfBlocksFast(), LLMessageSystem::getStringFast(), LLUICtrlFactory::getTabContainerByName(), LLMessageSystem::getUUIDFast(), LLPanelClassified::markForServerRequest(), NULL, S32, LLTabContainerCommon::selectFirstTab(), and LLPanelClassified::setClassifiedID(). Definition at line 830 of file llpanelavatar.cpp. References LLPanel::childSetEnabled(), LLPanel::childSetVisible(), gAgent, LLPanelAvatar::getAvatarID(), LLAgent::getID(), LLView::getName(), LLPanelAvatarTab::getPanelAvatar(), LLView::getParent(), LLUICtrlFactory::getTabContainerByName(), LLTabContainerCommon::getTabCount(), MAX_CLASSIFIEDS, S32, and LLPanelAvatarTab::sendAvatarProfileRequestIfNeeded(). Definition at line 880 of file llpanelavatar.cpp. References FALSE, LLTabContainerCommon::getCurrentPanel(), LLUICtrlFactory::getTabContainerByName(), LLPanelClassified::titleIsValid(), and TRUE.